Either spotting a gap in the market or just out of loyalty to its best buddy Microsoft, Dell has released its own Windows RT slate. Aimed at business users, the 10.1-inch Dell XPS 10 is another transformer-style laptop-tablet hybrid, shipping with an attachable keyboard that turns it into a laptop for working on the move. 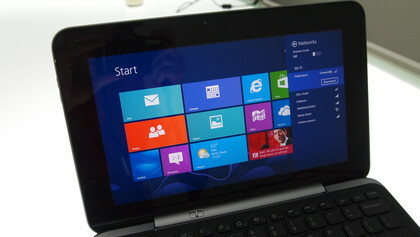 The Dell XPS 10 falls into a crowded market, with a host of devices aiming to please similar needs. 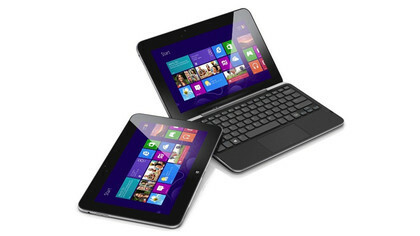 The Asus VivoTab, Samsung Ativ Tab and of course the Microsoft Surface RT are all offering the same USP, and there are other hybrids such as the Lenovo IdeaPad Yoga 11 too. While there’s no shortage of big players in the market, Dell’s late arrival doesn’t mean it’s too far behind; no RT device has gained any traction to date. The XPS 10 fits perfectly into Dell’s line up of high end machines, joining its XPS 12, XPS 13 and XPS 15 siblings. It looks like an XPS, with a soft black finish and a rubberised texture, and the same rounded chiclet keys adorning the base station. 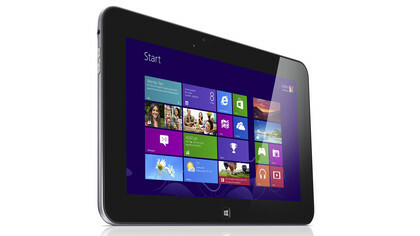 The XPS range is certainly high quality, and each component of the 10-inch RT tablet follows this design ethos to a tee. Compared to some notable offenders, Dell has managed to keep the price down to a reasonable level. 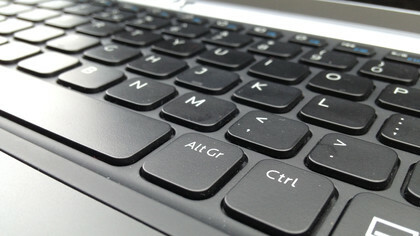 The base level 32GB device without the keyboard costs £299/US$449.99, the 32GB version with the keyboard dock costs £409/US$599.99, the 64GB without a keyboard costs £339/US$499.99, while the 64GB version with the dock is £444/US$649.99. That’s a significant saving over the Samsung Ativ Tab, and while you’ll find it in Dell’s business section, it’s pretty adept for anyone looking for a more productive tablet experience. The 10-inch Dell XPS 10 tablet is pretty unassuming to look at, and won’t be turning any heads on train platforms or Starbucks outlets. It’s black all over and rounded at the edges, so it won’t be winning any design awards. It clips into a sturdy hinge with a satisfying mechanical click, and as well as being more usable as a laptop, it can benefit from extra battery life that dramatically expands its lifespan. So can this Windows RT device inspire where so many have failed? Can Dell offer a great all-day working experience that’s still fun to use when it’s time to relax at home? 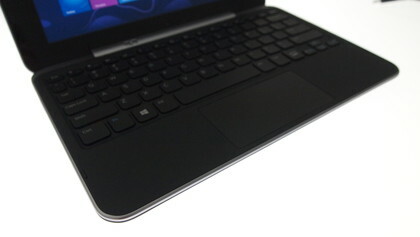 Read on as we put the Dell XPS 10 through its paces. If you’re late to this Windows RT game, let us put you in the picture. Windows RT devices run on mobile processors, like the ones in your phone, rather than the ones in your PC. That means they’re much more power efficient, meaning longer battery lives. It also means they run cooler, so you can get smaller designs. 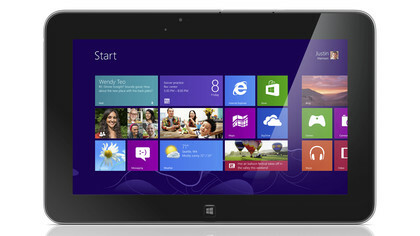 Inside the Dell XPS 10 is a Qualcomm Snapdragon S4 processor, clocked at 1.5GHz. Clearly, the performance here will be nowhere near the level of a traditional laptop, and it’s pretty far below the low power Intel Core i5 chips you’ll find on most Ultrabooks. The choice of processor limits the type of things you can do, too. Forget running desktop apps such as Photoshop or even smaller apps downloaded from the internet, they’re not compatible. Any program you run must come from the Windows Store, but Microsoft gives you a full copy of Microsoft Office 2013, which is pretty handy. We got the top range version, which means there’s 64GB of storage built in, giving you the same capacity as the iPad 4‘s premium model, but for £444 / US$649.99 (around AU$647) instead of £559 / US$699.99 / AU$759 – not a bad saving. Unlike the iPad, there’s opportunity for a load more storage as well, and despite the bad rap that Windows tablets get from 90% of the web’s experts, this is a big plus. 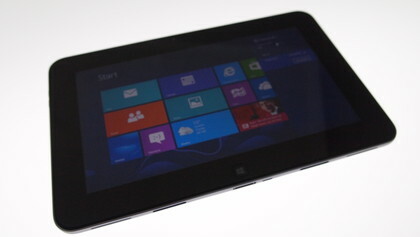 The Dell has two USB 3.0 ports and a microSD card slot, which will dramatically increase the opportunity for memory. 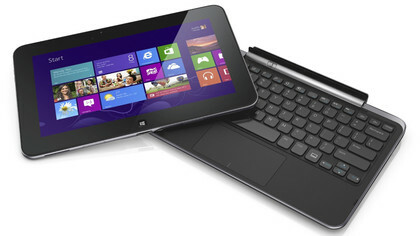 However, unlike the Asus VivoTab and Samsung Ativ Tab, the Dell XPS 10 only has USB ports on the keyboard dock, so if you opt out or leave it at home, you’ll only have a microSD port. There’s also a handy micro HDMI port, but again it’s located on the keyboard element. This means that Dell intends for you to carry this like a netbook most of the time, which exposes its design to an inevitable criticism. When combined with the dock, the Dell XPS 10 weighs an ungainly 1.3kg/45.86oz, which is heavier than most full-form Ultrabooks. As a 10-inch device this seems pretty needless, and it certainly weighs you down when working on the move. But the upside of this is that unlike the Samsung Ativ Tab, the added weight gives ballast to the device, so it doesn’t overbalance when typing. 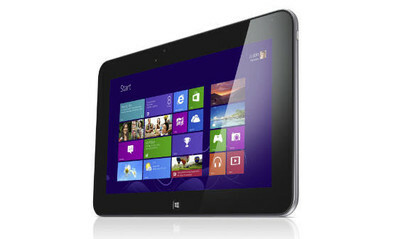 This constant tug of war between pros and cons shows why Windows tablets are having such a torrid time. Make them too light and they topple over, too heavy and it’s ungainly, too powerful and it’s too much money, scrimp on price and it becomes inferior. Nobody has got this right, and unfortunately, neither has Dell. While the Dell XPS 10 certainly carries some hallmarks of the XPS range, unfortunately this hasn’t been extended to the screen. The Dell XPS 13 and XPS 12 have some of the best screens available on a Windows computer, but the Dell XPS 10 only includes a 1366 x 768 panel, which is lifeless and dull. 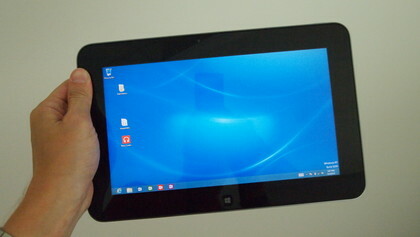 Our high definition movie tests showed a lack of vibrancy, below even the similar specced Microsoft Surface RT. When connected to the dock, the Dell XPS 10 turns into a netbook, for those who want to type emails and work more comfortably, but the comfort level offered is in itself dubious. About half this review was written on the Dell XPS 10, which was a tough slog. Firstly, the keys are extremely small, which means frequent mistakes were made. But the most frustrating part was the ease in which mis-presses on the trackpad could skip the cursor around the screen. Snapdragon chips have enjoyed a decent ride over the last year, and performance in the SunSpider Java test was adequate, if unspectacular. However, we aren’t totally enamoured with this benchmark, since it’s specifically designed as a test of the browser, so we’re going to be slightly more anecdotal in our criticism of the Dell XPS 10 and Windows RT in general. Firstly, the loading time for apps was frustratingly slow, and we were continually asked to wait at splash screens even for frequently used ones. We’re not sure whether Windows RT looks for online information before loading the app, or it just takes an age for the Snapdragon processor to load it from the hard drive, but it’s absurdly slow. The second complaint is less about performance but more about reliability. During our week with the device, we suffered numerous hard crashes of Windows RT requiring a system reboot, which took even longer due to Windows collecting information. We also had issues with the keyboard dock refusing to register after a couple of hot-swaps mid-document, again requiring a restart. When it works it’s seamless, which makes us think niggles with Windows RT are holding the Dell back. Where we would usually use 3D Mark to test a Windows machine, we were forced to use PeaceKeeper to access the grunt of the graphics part of the Snapdragon S4 chip in the Dell XPS 10. We weren’t expecting much, and as predicted, the average score of 188 put it in the relegation places in the tablet league table. Microsoft Surface RT vastly outperforms it, and the results show that Tegra 3-based Windows machines fare better than their Qualcomm brethren. We looped HD video easily – more on that in a moment – but with such lagging numbers we’re concerned at how far gaming could be pushed on such a Windows RT device. Of course, with such a poor selection of titles available on Windows Store at the moment, this shouldn’t pose an immediate problem. So far we’ve given the Dell XPS 10, and Windows RT, a bit of a slamming. Combine our thoughts with the recent stories about RT’s future, and you’d be forgiven for steering well clear of this obvious donkey. Well, there’s one factor that we believe shouldn’t only save Windows RT, but should also be a key consideration going forward. Battery life has been a standout of most Windows RT machines, and the Microsoft Surface RT enjoyed a whopping 10 hours away from the mains, but the Dell XPS 10 offers double this, making it the single longest-lasting hybrid device we have ever reviewed. We employed a normal looping HD video test, which is standard for machines with mobile processors, and the tablet lasted 10.5 hours – a monster battery score. Let’s put that in context: we started watching a video when we went to bed, and when we woke up it was still going. While that’s impressive enough, it gets better still. The second battery in the keyboard dock offers another eight hours, giving an overall total of 18.5 hours of HD video playback. When we set out to review Dell’s Windows RT device, we highlighted two areas we felt it needed to address. The first was for it to inspire where other Windows RT devices – Surface RT included – have failed, and the answer here is unfortunately no. The Dell XPS 10’s black plastic appearance and unnaturally heavy build make this an instant turn-off. While it may be for sale among its business offerings, that doesn’t mean consumers should sacrifice a pleasing build or competitive portability. The next was whether the Dell XPS 10 could offer an all-day working experience that’s still fun to use, and we have to say it does. The huge battery life blows away all opposition, even the impressive Surface RT, and the lightweight build makes it just as adept for comfortable use on your sofa. Of course, the limited range of Windows 8 apps means it’s not as fun to use as an iPad or Google Nexus 10, but that’s not a criticism of the Dell XPS 10, just Microsoft’s stuttering OS. The huge battery life is truly impressive, and it gives us hope that a concerted push from Microsoft could give Windows RT a future. In tablet mode, the Dell XPS 10 is enjoyable to hold and use, and the screen is adequate for day-to-day use, though media connoisseurs will miss the Retina-competing panels of its competitors. 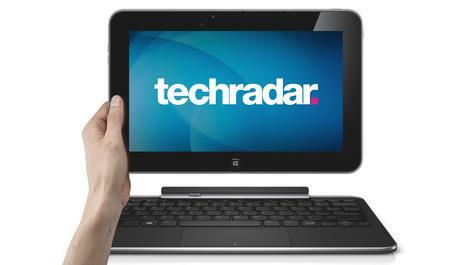 While the build is acceptable as a slate, we’re perplexed by the weight when the dock is attached. Much of this will be due to the big battery cell in the base, and it does offer a complementary weight bias, which stops the tablet from toppling backwards. However, this won’t appease mobile workers who will feel that a 13-inch Ultrabook offers similar portability, with the much-needed bonus of an extra three inches of comfort. The keyboard is cramped, as any 10-inch device would be, and it does make us wonder how far we’ve come from the dark days of the netbook – the Dell XPS 10 is similarly underpowered and similarly uncomfortable during long periods of typing. The Dell XPS 10 is one of the finest Windows RT devices we’ve seen, and comes at an attractive price. However, it’s certainly a secondary device that can only complement another full-form device. If you’re looking for a proper, singular upgrade, a full-fat Windows device is still your only option.